GenoPro allows you to track down each union or marriage for individuals in the same family. Because of religious or legal issues, some people celebrate more than one wedding with the same individual. The Unions tab allows you to document this information clearly. A marriage is the word used for any type of union. Specify the type of marriage; it can be Religious, Civil or Other. If the marriage type is specific you can write detailed information in the comments section. Enter the date of this wedding and the location of the wedding; you may specify details such as the name of the church. The title and the name of the individual that officially declared the union. The choices are: Attorney, Bishop, Canon, Curate, Dean, Doctor, Father, Midwife, Minister, Notary, Pastor, Rabbi, Reverend, Priest and Vicar. Names of the witnesses; multiple names, separated by commas, can be entered if needed. Source information of the marriage. The divorce is the break of the marriage or the union. This option specifies that the marriage is no longer legally valid. Annulment is typically limited to fraud, bigamy, and mental incompetence. Specify the person who officially requested the break of the marriage. The possible values are: Husband, Wife, Both / Mutual Agreement or Don't Know. Enter the date of the separation and the location of the official event. The professional person who represents the individual in the divorce cause; for example a lawyer. The name of the company or the individual that was responsible for the completion of the divorce. Source information of the divorce. Any other pertinent information or details about the union or the divorce should be entered in the comments field. 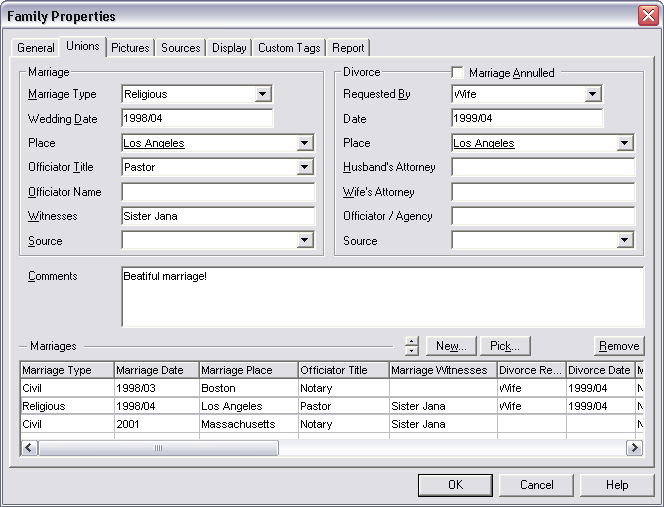 The lower section is a grid that displays all the marriages/unions of the family. They can be selected to be edited or removed. If you remove a union by accident, you can use the Pick button to relink-it to the family.